Sometimes you just GOTTA have something sweet. 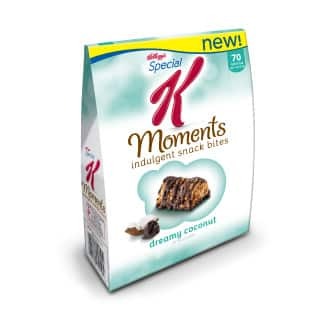 But before you go and dive headfirst into that calorie laden dessert that will ruin all the good eating you did all day, consider having one of today’s Fabulous Food Finds – Special K Moments Indulgent Snack Bites. I found these recently at my local Target, and was pretty excited to give them a try. They come in two flavors – Caramel Pretzel Bliss and Dreamy Coconut. They were both fantastic! And at 2 Points each, they are just the right size to satisfy your sweet tooth without going overboard. BONUS: They freeze really well! After discovering how tasty they were, I went back to Target and grabbed a few more boxes to stash in my freezer. I always get a sweets craving in the evening, so these Special K Moments have been a lifesaver. I like the coconut chocolate…….